On Thursday, May 3, 2018, we unveiled our latest art installation, ArtHouse Patio. We celebrated this new outdoor addition with a day full of events, live performances, and activities! Thank you to our sponsors Bloomberg Philanthropies and The John S. and James L. Knight Foundation, we couldn’t have done it without you! Special thanks to our artistic director Theaster Gates and his amazing Place Lab team, our project director Sheila Freeman, executive chef Lamar Moore, City of Gary Mayor Karen Freeman-Wilson, Project Onward and their talented artists, the amazing performers from the day and the entire NWI and Gary community! By the end of November, ArtHouse will be bringing a place to dine, enjoy art and socialize to downtown Gary. However, it couldn’t get there without the help of the community. A lot of work has gone into transforming the 5th Avenue space into something that will not only be useful for members of the community but that could also draw consumers and other businesses to the area. “I think it’s a big opportunity to bring more people to Gary,” said Randy Plant, a resident of Gary. Randy and several other residents of Gary and the surrounding neighborhoods have been working with ArtHouse to get the space ready for the grand opening event on November 19. They have contributed by helping with demolition, cleaning, painting, sewing/upholstering and more. The dedication of those working on bringing ArtHouse to life is good sign that the community is behind its newest art installation and dining venue. “I am a photographer myself so I’m waiting to see what type of art will be placed in here,” said Randy. Once ArtHouse opens, various artists will have the opportunity to display their work in a gallery-like setting. Additionally, local cooks and aspiring culinary businesses will be able to share their culinary talents by serving their own recipes to those who frequent ArtHouse for dining. The outside of the building will reflect the beauty of the art and community on the inside, as well. The exterior got a new coat of paint and a metal armature has been affixed to the brick façade. Colorful lanterns will adorn this armature, projecting an illuminated art installation to be seen from blocks away. “It’s nice. It’s beautiful,” said Kitty Aleman, a resident of East Chicago who has come with two of her cousins to help with the ArtHouse project. ArtHouse is also utilizing the renovated outdoor space. A parklet featuring music, lighting and seating is planned for the southeast corner of the property. This will allow visitors to gather outside and enjoy the illumination. The grand opening of ArtHouse will give everyone the opportunity to check out Gary’s newest establishment for themselves. Visitors to the event, which takes place on November 19 from 4-6 p.m., will receive tours of the facility, a gift bag filled with recipes collected from local cooks and pastries from several different area bakers. Food trucks will also be on hand to sell their fare. Learn more at www.ArtHouseGary.com. Grisela Estrella uses many of her evenings and weekends completing work for her small business, a personal hotdog stand from which she sells homemade food to those in downtown Griffith. But now that the weather has gotten colder, Grisela has been spending her time assisting with the production of downtown Gary’s newest establishment: ArtHouse. “I like taking pride in stuff like that,” she said. Grisela learned of ArtHouse from friends in a sewing class that she takes. She made some calls and got signed up to help with the cause. She has been able to use her sewing skills to help ArtHouse by reupholstering the seats of all the chairs that will be part of the culinary business incubator and pop-up café. “I think a lot of people are going to end up benefitting from this place,” Grisela continued. ArtHouse will have its grand opening on November 19. Members of the community are welcome to come out and receive tours of the facility, along with free recipes for dishes created by locals. Once ArtHouse opens, its culinary business incubator will provide members of the community the opportunity to taste unique, local dishes but will also give those looking to learn more about getting involved in the restaurant industry with a place to go for information. One way ArtHouse will accomplish this is through hosting various classes to be taught by those involved in the restaurant and food service industry, like Grisela is with her hotdog stand. Grisela has spent the last several years selling hotdogs, tamales and Mexican corn among other dishes out of her cart. She said she is excited to be able to share information about establishing and maintaining a food cart with those who attend ArtHouse, especially since she has been involved with the production of the social kitchen. To learn more about ArtHouse and how to get involved with culinary classes and demonstrations, like Grisela’s, visit www.ArtHouseGary.com. In recent years, the downtown area of Gary has been undergoing somewhat of a revitalization. The implementation of a minor league baseball stadium, some new public art installations and technology-based business ventures has brought more and more people back to visiting the Steel City. With the addition of ArtHouse to Gary’s downtown area, even more possibilities for events and gatherings are on the horizon. ArtHouse will offer an art gallery space for local and regional artists to display their work and a pop-up café for home cooks to make their signature dishes for members of the community. During times when the building isn’t being used as gallery space a café, it can be rented out as a community resource serving as a premier venue in a downtown location. The food and supplies for all of these functions could be provided by local farmers and grocery stores that wish to partner with ArtHouse. Many ideas for community use of the building have been generated by the partners of ArtHouse. For example, the space can be utilized as an accessible commercial training kitchen for emerging businesses. It can also be used to hold other culinary operations or host community dinners for Gary residents. These functions would be serviced by local individuals participating in the ArtHouse job training program and all would have the need to be supplied by local vendors. There have also been discussions surrounding the possibility of hosting family recipe feature events. Local home cooks could showcase some of their recipes with other members of the community via a demonstration and tasting. The location of ArtHouse is what makes it ideal for these types of gatherings and events and others. It is in the downtown area and is not far off the highway; perfect for grabbing a bite to eat before or after a baseball game or meeting up with friends and family traveling in from out of town. Those traveling to ArtHouse would get to experience what NWI farmers and grocers have to offer. To get a feel for what ArtHouse is all about or to learn about becoming a supplier for ArtHouse events, visit the grand opening on November 19 from 4-6 p.m. For more information, check out www.ArtHouseGary.com. There are not currently many dining options in Gary. When residents want a night out, they must often travel to Merrillville or Hobart. This is just not feasible, especially for those taking public transportation. ArtHouse: A Social Kitchen looks to give Gary diners a new option that is much closer to home. ArtHouse opens to the public on November 19 and will offer a dining space set inside of an art gallery. In addition to offering gallery dining, ArtHouse will have outdoor seating where guests can enjoy their food and drink in the summer months. This combination makes ArtHouse a truly unmatched destination for Gary diners. Although outdoor dining can only happen when the weather is warm, ArtHouse plans to utilize the space for season-specific activities in the future. For example, the November 19 grand opening will feature fire pits for guests to toast marshmallows after their tour of the facility. Perhaps one of the most unique aspects of ArtHouse is the plan for who will be cooking the food. ArtHouse will serve as a culinary business incubator for individuals in the community who may be looking to begin mass-producing and selling their signature dishes. Diners will have the opportunity to choose from a menu of offerings by the home cooks, giving them a true taste of the city of Gary. Mark your calendar for the grand opening of ArtHouse on November 19 to be one of the first to experience the newest food and art space in Gary! Visit www.ArtHouseGary.com for more information. 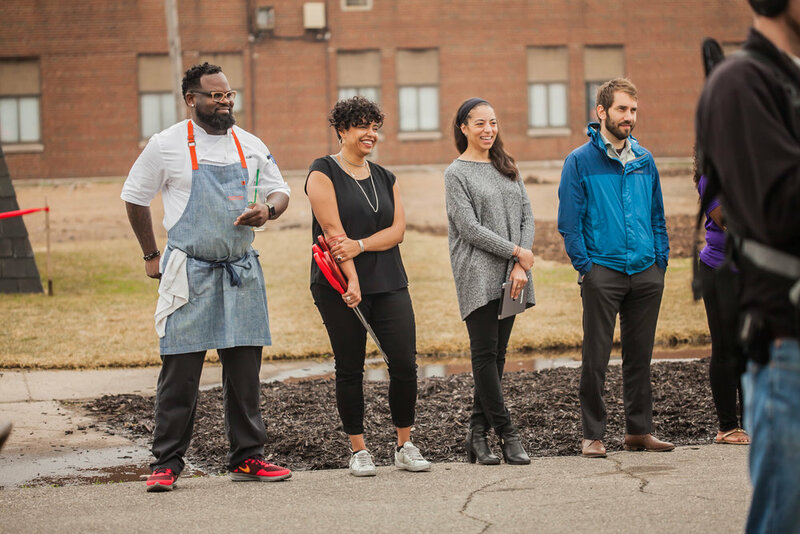 ArtHouse: A Social Kitchen is a new Gary institution that will be opening its doors at 411 E. 5th Avenue on November 19. The goal of the ArtHouse project, which is a collaboration involving many funders including Bloomberg Philanthropies and the Knight Foundation, is to create a space that positively reflects the city and provides a platform for economic and artistic activity in the downtown area. The ArtHouse project is multi-dimensional and will offer something for everyone. However, one of the most unique aspects of ArtHouse is the proposed culinary business incubator. This will give home cooks from across the city the opportunity to make their dishes on a large scale and share them with the public. Groups can rent out dining space at ArtHouse for any number of functions. As part of their reservation, the groups will be able to select dining choices for the event from a variety of menus. When an ArtHouse home cook’s menu is selected, that individual will be able to make and serve their food to guests through ArtHouse’s commercial kitchen. This will not only provide those renting the space with a unique, memorable dining experience, but will allow the cooks to share their dishes and garner recognition. Those cooking at ArtHouse will be able to utilize local providers, like farms and grocery stores, for the ingredients needed in their signature dishes. They will also have a staff of individuals participating in ArtHouse’s restaurant job training program to assist with the service. ArtHouse will also address the need for dining options in the city. In recent years, many community favorite restaurants have left the Gary area and citizens often find themselves having to travel to neighboring towns for a night out to eat. ArtHouse’s location on 5th Avenue makes it easily accessible to many living in the center of town and those taking public transportation. This also means that the home cooks who choose to display their talents at ArtHouse will likely have access to a larger audience. Want to learn more about ArtHouse? Mark your calendars for the grand opening on November 19! There will be marshmallows toasted over bonfires and tours of the facility will be conducted from 4-6 p.m. Visit www.ArtHouseGary.com for more information. Arleen Peterson only recently began working at ArtHouse, but she came on board with a vision for the city of Gary and has already set out to do the work of engaging the community in support of all that ArtHouse has to offer. Arleen, who works as ArtHouse’s Community Engagement Coordinator, is enthusiastic in sharing her vision. Her title says a lot, but her drive, energy, and dedication speak volumes. One of Arleen’s goals is to change the perception of the city of Gary and to “change the perception of public art” for the Gary community. In revitalizing Gary, Arleen also stated that the overall transformation will stem from the community’s response. The grand opening of ArtHouse on November 19 will provide an opportunity for people to experience public art. She envisions ArtHouse as “a way to lighten up 5th Avenue,” where it is situated across from the Gary South Shore Railcats’ stadium. “Nothing is set in stone,” Arleen stated. “The space is designed FOR the community,” she adds, and by engaging the community, she is hoping to gain their input on how to make ArtHouse a great space for them. ArtHouse will also serve as a culinary business incubator, where those with an interest in a culinary career can gain firsthand knowledge that can help them start a business. By coming in for a tour, culinary entrepreneurs will be able to see how ArtHouse can help meet their needs. Because ArtHouse will be the first publicly available commercial kitchen space in Lake County, residents of Gary and the surrounding area will now have a convenient place to prepare their goods to sell. On November 19, you can join Arleen in her excitement about ArtHouse during its grand opening celebration, taking place from 4-6 p.m. Be a part of Gary’s revitalization as you take a tour, view the artwork, listen to great music, and savor in the flavors that will be available onsite. In the meantime, visit www.ArtHouseGary.com for more information. When the name ArtHouse: A Social Kitchen was created, it had nothing to do with social media. However, the name does imply what social media is—a conversation, an interaction, or a gathering that serves as a catalyst for sharing information, opinions, insights, ideas, experiences, and perspectives in an online platform. Gary’s ArtHouse serves in a similar fashion but in the form of a physical space, a place where artists, art enthusiasts and supporters can collaborate to share in the celebration of and appreciation for art. Like the variety of social media channels, the diverse splendor of art is reflected in ArtHouse’s premise for serving as “a unique destination for food, culture, and art,” all of which overlap. By definition, culture can be described as the beliefs, customs, and practices of a particular society, group, time, or place. Food and art are a part of culture. Social media is a method that can tie these together, and it meshes those art forms well because artists have so many avenues to promote their creative expression in ways that were not available even 15 years ago. Artists can now have conversations, interact socially and share their art well before setting up shop in a gallery or at an art show or exhibit. Social media has made it possible for artists to showcase their unique designs, creations, and concepts and to provide frequent, real-time updates on what they are creating. Through the ability to post pictures, videos, and blogs, marketing art can become second nature to even a novice social media user who mainly wants to focus on what they do best—creating something that will impact and inspire. ArtHouse is an ideal space for supporting the social media presence of artists who seek to display their work, or to perhaps engage a prospective buyer who desires to connect more directly with an artist. Particularly in the culinary arts space, seeing images of a prepared meal online is an ideal teaser that can drive a hearty appetite into the place where the meal is being prepared. Serving double duty as a culinary business incubator, ArtHouse is also available for local chefs to rent commercial kitchen space so they can perfect their culinary creations. For more information about ArtHouse, visit www.ArtHouseGary.com and be sure to connect with ArtHouse on Facebook, Twitter, and Instagram. It’s obvious of course that a house is a building structure, and a kitchen is typically part of a house. Gary’s ArtHouse: A Social Kitchen is so much more than simply a combination of those words, and while the finished work is now a place for artists and the community to gather in a warm and engaging environment, the behind the scenes labor that went into creating this space should not be taken for granted. ArtHouse, located at 411 E. 5th Avenue in Gary, started as an idea, to create a space that would eventually house the recipe by which art will be embraced, appreciated and nurtured, much like food from your own kitchen. Careful planning went into the building and logistics of ArtHouse, details that the average person doesn’t think about. 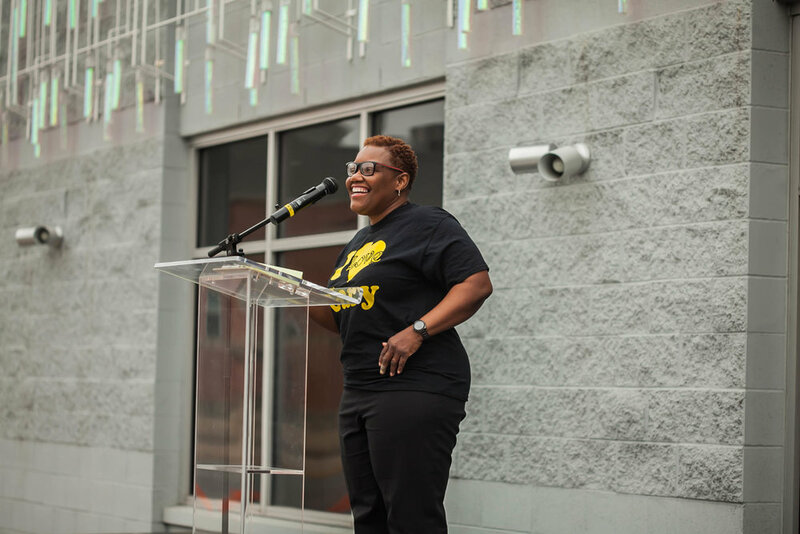 From the hard work of carefully selected Gary residents, who were handpicked in part because of their dedication to helping rebuild the Gary community, ArtHouse became a reality. It’s been said that “it’s the little things that count.” Ask Kitty Aleman, who has been responsible, as part of a team, for cleaning the chairs and keeping the seat covers looking nice. Kitty joined the ArtHouse project via the recommendation of another member of the community. Grisela Estrella, who owns a hot dog stand in Griffith, is putting her sewing skills to use to help support the ArtHouse initiatives. Grisela handles reupholstering of the furniture at ArtHouse and mentioned that she “visualizes ArtHouse as a place to feel safe, interact and socialize” and believes that it will revitalize the community. ArtHouse is also inspiring families to work together. Janet Plant, along with two of her children, Randy and Latwon, each have a special role at ArtHouse. While Janet—who sees this as a good start for the community—helps with cleaning and the overall planning for ArtHouse, Randy and Latwon are busy with more of the heavy-duty work. Randy Plant volunteers his skills in basic construction and “anything else” he can help with. He stated that he feels good about the revitalization of Gary and sees ArtHouse as “a big opportunity.” Randy, who is also a photographer, hopes to display some of his work at ArtHouse. Latwon Plant, who handles cleaning, polishing, and unloading of materials from the trucks, considers ArtHouse as a great place for all ages. He has even brought his daughter in on occasion to help. He believes that ArtHouse “will breathe a lot of life” into the Gary community. ArtHouse reminds us of the importance of a community working together. This sets a positive example, and it also shows that the work of rebuilding a community is not just about the building itself but about the spirit of collaboration and sharing a common vision. ArtHouse is positioned to be a major part of Gary’s revitalization. For more information about ArtHouse, visit www.ArtHouseGary.com. Don’t forget to attend the grand opening celebration of ArtHouse on November 19 from 4-6 p.m. Get a sneak peak of some of the artwork, take a tour of the facilities to gain an appreciation for all the hard work that has gone into creating ArtHouse, and savor some of the flavors from local chefs. Join fellow members of the Gary community as ArtHouse: A Social Kitchen prepares to celebrate its grand opening on Saturday, November 19 from 4-6 p.m. ArtHouse is a new business entity, located at 411 E. 5th Avenue in Gary that will serve as a multi-dimensional structure and seeks to spark revitalization for the city of Gary. Supporters of ArtHouse, including investors Bloomberg Philanthropies and the Knight Foundation believe that it will provide a positive reflection on Gary and that it will offer resources for further community and economic development while inspiring more of an appreciation for public art. ArtHouse has been described as “a unique destination for food, culture and art.” Those who attend the grand opening can expect to experience just that. The grand opening celebration will feature musical performances by G-B'z (God Brothaz) Entertainment and Anointed Voices Choir. They will have an opportunity to meet artists Ripple & Wilson, along with Theaster Gates Jr, who is the Artistic Director on the project. Mayor Karen Freeman-Wilson will also be present. Food will be available for purchase from several local vendors including Mama Pearls, which is a partner in the project and is housed in the same building as ArtHouse. Silver Box and Cool Runnings food trucks will also sell food, and two local culinary artists will be featuring and providing some of their dessert specialties. Come see for yourself what all the buzz is about as ArtHouse prepares for its launch into being part of Gary’s revitalization. View the artwork, take a tour, and savor in the flavors that will be onsite. In the meantime, visit www.ArtHouseGary.com for more information. NEW YORK – September 15, 2016 – A short documentary series created by Bloomberg Philanthropies provide a behind- the-scenes look at how four cities are using temporary public art projects to bring together local government and artists to increase access to the arts, elevate critical issues, foster community engagement and highlight creativity across local industries through the Bloomberg Philanthropies Public Art Challenge. Each of the three-minute shorts, which feature interviews with mayors, artists and cultural leaders working together to develop risk-taking public art projects, showcases the unprecedented levels of contact and cooperation between the arts and civic leaders. Created to show the challenges and ambitions behind the cities selected to participate in the foundation’s Public Art Challenge, the video series can be viewed on YouTube via the hyperlinked titles below. Additionally, these and other videos are available on bloomberg.org. In this video, Gary, Indiana Mayor Karen Freeman-Wilson discusses the economic, political and social challenges that have affected the city and introduces a culinary and visual arts center conceived by artist Theaster Gates with an innovative approach to addressing the complex challenges facing Gary. Spartanburg, South Carolina’s project uses public art to promote crime prevention and as a catalyst for building police-community relations. As interviews with police officers show in this documentary, the light-based project, designed by artist Erwin Redl, is already bringing together residents and law enforcement officials. Interviews with artist Adam Frelin and architect Barbara Nelson describe a multi-city light project that will engage residents, community organizations, local government, and private sector partners to address issues of divestment and building vacancy throughout Albany, Schenectady, and Troy, New York. Los Angeles’ first-ever public art biennial included 13 artists presenting challenging ideas around the topic of water. In this video, Danielle Brazell, manager of Los Angeles’ Department of Cultural Affairs, and participating artists explain how the arts and creativity can be deployed to change perceptions and behavior around one of the city’s most pressing issues. Bloomberg Philanthropies has supported innovative public art projects in cities around the world. On October 13, 2014 Bloomberg Philanthropies announced the launch of the Public Art Challenge, a new program to fund temporary public art projects in cities across the U.S. The foundation invited mayors in cities with 30,000 residents or more to submit proposals for innovative temporary public art projects that have the potential to catalyze urban growth, promote creativity, drive local economy, and add to the vibrancy of cities. Submissions for visual and performing arts, including multimedia installations, were considered. Out of 237 city applications, the cities of Gary, IN; Los Angeles, CA; Spartanburg, SC; and a partnership between Albany, Troy and Schenectady, NY were awarded $1 million from Bloomberg Philanthropies’ Public Art Challenge to execute their projects. The Los Angeles’ project CURRENT: LA Water ran from July 16 – August 14, while the other cities will open in the fall. Bloomberg Philanthropies works in over 120 countries to ensure better, longer lives for the greatest number of people. The organization focuses on five key areas for creating lasting change: Public Health, Government Innovation, Environment, Education, and the Arts. Bloomberg Philanthropies encompasses all of Michael R. Bloomberg’s charitable activities, including his foundation and his personal giving. In 2015 Bloomberg Philanthropies distributed over half a billion dollars. For more information, please visit bloomberg.org or follow us on Facebook, Instagram, Snapchat, and Twitter @BloombergDotOrg. Jeana Ripple + Barbara Brown Wilson are a two-person team that will submit a proposal for the ArtHouse public art commission Illumination. The artists selected for ArtHouse's public art commissions will be announced in late May 2016. What motivated you to apply for the Bloomberg Philanthropies Public Art Challenge at ArtHouse? If you have a connection to Gary, what is it? We are inspired by the vision for ArtHouse: a place that uses art and food to create both community and opportunity. Jeana: I’m from the Midwest (Cleveland) and have lived in cities across Indiana, Ohio, Illinois, and Michigan. This led me to develop an architectural practice focused on collaboration with manufacturers as a way to promote the local economy. I’ve seen manufacturing form the heart of these cities and at times also struggle to re-invent itself. Barbara: My work focuses on community engaged design and education programs. So the history of Gary’s education innovation is particularly compelling to me. Gary started a national movement in education, where students at community schools learned through a work/study/play model focused on learning by the tactile experiences of making. Our combined interest in promoting local community and manufacturing made ArtHouse a particularly inspiring project. Inside Woods of Net pavilion, designed by Tezuka Architects. Photo by Abel Erazo. Are there examples of public art works that have had an impact on you? The Good Neighbor mural in Cleveland’s Little Italy had an impact on me as a kid because it was a source of pride and marking of place. Today, project’s like the Woods of Net Pavilion at the Hakone Open Air Museum by Toshiko Horiuchi MacAdam are an inspiration because they prompt curiosity and play in children. We’re after all of these effects with this project—promoting pride, place, play. Some goals—like the translation of local material and manufacturing technology—are shared across projects. But a public commission in particular needs to be interactive, inspiring, and a place in which residents feel a sense of authorship. Why do you feel that public art is important to communities? Public art plays so many roles in communities. Its been shown to cultivate community cohesion, to drive economic revitalization, to serve as a vehicle for education, to build a collective sense of identity in a place and also pride for that place, and to encourage residents to stop and utilize their senses—which is fundamental to improving quality of life and human health. Our project is designed to provide educational opportunities, celebration space, inspiring and playful experiences… all of which contribute to the joy people feel in their immediate environment. In this project, the art is also designed to provide social amenities like internet access and bike repair stations, attracting people to participate in the entrepreneurial initiatives at ArtHouse. Ripple Architecture Studio project, Evaporative Skin, featured in the TEX-FAB SKIN Digital Assemblies Exhibition. Should your proposal be chosen as the winning artwork, how do you envision the Gary community would be involved in bringing the work to fruition? The design facilitates opportunities for involvement that range from design/build workshops to the creation of a documentary to a social making party at the ArtHouse opening. We are planning to provide equipment and further training in film-making for a local youth video club to document the manufacturing and assembly process involved in the commission. We’re hoping to work with local partners to create opportunities for youth to be involved in construction and have created several “learning-by-doing” scenarios. Finally, we envision a launch party that brings the greater Gary community to the makers table during the opening celebration. The launch event at the end of the installation process could double as a Social Making event where community members can learn how to build their own lanterns like those in our design. This event could also serve as the film premiere for the youth-made documentary on the installation process. The hope is that this installation is one articulated by joyful collaborative making and community building experiences, and that the final product is something to which many Gary residents feel they contributed and want to return to and enjoy frequently. What do you want to convey about cities in your commissioned work of art (or in the process that leads up to its installation)? Cities each have their own material and innovation culture that can be celebrated through its art. Cities can spark curiosity, inspire new thinking, and reinvigorate your senses, while also honoring and embodying within them the history of that place. Anything else you’d like to add, or tell ArtHouse fans? ArtHouse is the people who are dedicated to this effort: Gary residents and their Mayor Freeman-Wilson, Mama Pearl’s, Bloomberg Philanthropies, the Knight Foundation, and especially PlaceLab. We’re excited to contribute a design that will continue to build on the power of community, and on the energy of this creative infrastructure. Riccardo Mariano is a Berlin-based environmental artist, architect, and designer who will be submitting a proposal for ArtHouse public art commission Surface. The artists selected for ArtHouse's public art commissions will be announced in late May 2016. I believe my architecture background and [design partner] Polina Chebotareva's psychological background and our specific experience in public art are especially relevant for a project for which understanding the potential of the existing building and its surroundings is key to the development of a proposal capable of engaging the community with its enhanced aesthetic. ArtHouse is an inspiring opportunity to design an exemplary project for the city of Gary that demonstrates how existing architecture, public art and community engagement can create places of identity and conviviality. The Public Art Challenge at ArtHouse gives the possibility of working with a whole community and giving its rich history a new life. As a design team rooted in European culture we bring an approach to the project which looks at Gary with fresh eyes. The Jewish memorial in Berlin by Peter Eisenman, is an inspiring example of a public artwork with great cultural significance becoming part of the city and its citizens' everyday life. It is a work of art that allows both for interaction and reflection, being adaptable to the activities of visitors, while at the same time being strongly rooted in history. South Bronx (S) Heroes, part of the JR Inside Out Project. Another artwork that comes to mind is by street artist JR and his Inside Out Project. where posters with portraits of the people living and working inside of a building were posted on its exterior, opening up the interior and making the inhabitants part of the street and public life. Does your approach to a public commission differ from the approach you take to other work, such as for private clients, exhibitions, galleries, or targeted audiences? If so, how? If not, why not? Working on public commissions means first and foremost working with the everyday life of communities. Such work creates an active dialogue between the artwork and public life, and allows reflection on how and why public space can be used. Working on public commissions also allows— to a greater extent— meaningful collaborations with other professionals who can help understand the social context and help set the artwork into a meaningful dialogue with the community. Likewise, it allows having collaborations with local activists and citizens, making it a more inclusive process. It is in public commissions that the catalytic power of art for social change emerges. Public art has the potential of making a more significant impact as it also addresses audiences that do not visit exhibitions or galleries. Public art has the potential to start a dialogue, to initiate shared activity and to inspire. It addresses social issues where they are, rather than from a detached stance in an art context. This makes it accessible and inclusive, widening its reach and activating its social potential. It also allows the renegotiation of public space. Public artworks can facilitate new actions in a social context that one already knows and uses by habit. This invites the community to reflect upon how they share and use space. Thus, public artworks initiate the exploration of possibilities of shared space and trigger new dialogues and encounters. Public engagement is at the core of the proposal. [The proposal] invites the public to have a seat and share a moment together. Forming the group Gary's vision, who will use [the proposal] to facilitate meaningful events and dialogue, will further stimulate public engagement. Steel has been chosen as the main material for the installation because it bears a special role and meaning in the history of Gary. The design team will aim at engaging local steel workers as consultants for the production of the sculptural façade enhancement. This engagement will facilitate a practical and emotional connection between Gary's local knowledge as a proud steel city and Gary's future resource as a thriving cultural and innovative community. Furthermore, this involvement will foster an inclusion of different audiences for Arthouse Gary. Interior rendering of Istanbul Disaster Prevention and Education Centre, a conceptual design by Riccardo Mariano. At the core of urban city life is sharing space and experiences. Public space should support this conviviality, and be generous by creating places for people to sit, relax, meet, be inspired and exchange ideas. [The proposal], being an interactive facade with a shared bench and public library, attempts to convey this. Opening up the inside of ArtHouse to its surroundings, [the proposal] draws and gives meaning to its wider context by becoming a gathering place and new destination within the city. The artwork combines the memory of the city with its future dreams and ambitions through its materiality, identity and social significance. [The proposal] not only facilitates sharing knowledge to its future visitors in Gary, but is also conceptualized by working interdisciplinary and learning from each other. Being a team of an architect and a psychologist allows us to look at public space and understand the potential of a public artwork from multiple angles, and this is truly enriching both for the work process and for the design concept. Hopefully many more interdisciplinary meetings will be made while sitting at ArtHouse and sharing perspectives with each other. Riccardo Mariano is an artist, architect and designer based in Berlin, Germany. Trained as an architect, he earned a Master of Science in Architecture with honours from Accademia di Architettura di Mendrisio Switzerland. Following his graduation, Riccardo joined BIG, Bjarke Ingels Group in Copenhagen (DK) where he advanced his architectural practice working on a diverse range of projects worldwide. Since 2012, Riccardo has been part of the design and development team at Studio Olafur Eliasson in Berlin. Collaborating with the Studio, he has been working on the design and development of architectural experimentations, large-scale installations and sculptures. While working closely with Olafur Eliasson, Riccardo has been independently undertaking public art projects. In 2014, he led an interdisciplinary team for the design Herning Energy Promenade, awarded with the LAGI Green Cities Special Jury Prize. In 2015, he was awarded for Wonderland: East lake Tai international public art competition with the entries Flying Bi and Tao Pavilion. Chris Siva is one of the six finalists who will submit a full proposal for ArtHouse's public art commissions. Silva will propose a work for the commission Surface. The artists selected for ArtHouse's public art commissions will be announced in late May 2016. I won't pretend that a major motivation for applying isn't trying to keep my bills paid, but I've chosen the work that I do because I truly love it. I make a variety of art, but the public work which I create with the help of others is definitely some of the most satisfying. I try very hard to keep my work rooted in a spirit of generosity and service to my fellow humans, so the mission of ArtHouse feels right in line with my own. The Green Citadel, in Magdeburg, Germany, designed by Hundertwasser. Photo by Basileia Gorgo. The first pieces of public art which really grabbed me by the collar were the graffiti pieces along the rooftops in Chicago, and on the subway cars in NYC. Another thing which I remember being incredibly inspired by was the architectural work of the Austrian artist, Friedensreich Hundertwasser. There's so much great public art work being created all the time, so it's hard for me to even keep track of what my latest public art inspirations are. It feels like the bar keeps being raised every month. Yes, absolutely. I avoid promoting despair in all my work, but my installation pieces often meditate on many of the unhealthy ways we treat our world. Because of that they can feel a little heavy, and I often think of them as visual blues songs. Some of my small personal work can also lean that way at times, but when it comes to large permanent public art, I focus on creating more clearly uplifting and joyful work. When I know things are going to be there for long term I feel that I should fully engage my idealism and try to represent the change I want to see in the world. With All of Our Might, mural designed by Chris Silva and created with 9 youth apprentices/collaborators for Yollocalli Arts Reach. Public art represents an investment in an area. It shows that someone cared enough to try to create beauty there, and that effort can help to inspire others to try and do the same. Colors, shapes, and sounds have a strong psychological effect on people, and I believe that when they are used to successfully create something of beauty there are usually positive side effects. My proposal is very open ended. I've created a design solution which leaves room for original content to be added by local participants. In addition to that, the final fabrication method of the piece has been left intentionally unresolved so that I can continue to seek out creative ways to involve locals in the fabrication process. My proposal depends heavily on Gary locals getting involved for it to really resonate they way I would like it to. If my proposal gets green lighted want this to be something the local participants were proud to have been a part of. I am promoting love, and that message is more universal in scope, but my artwork has been impacted heavily by my experiences in the city, so abstract as it may be, I feel like I am in speaking in a dialect of city life. The process I've proposed involves people working well together for the successful outcome of the project, and that strikes me as something which holds true for cities as well. Love yourself, love your neighbor, love your city. I'm just honored to have been selected as a semi-finalist, and whether I am awarded the commission or not, I'm excited to see this kind of investment in Gary happening and hope to see it continue. Though born in Puerto Rico, Chris Silva’s creative pursuits are firmly rooted in Chicago's urban culture. Since the late 80s he has been a prominent figure in Chicago’s graffiti and skateboarding scenes, and building on this foundation proceeded to play a significant role in the development of what is now commonly referred to as "street art". Chris splits his time between working on large-scale commissions, producing gallery-oriented work, and leading youth-involved public art projects. A self-taught sound artist with roots in DJ culture, Chris anchors a collaborative recording project known as This Mother Falcon, and integrates these audio compositions into his installation work. Chris was the recipient of an Artist Fellowship Award from The Illinois Arts Council (2007), a 3Arts Award (2015), and is represented by Linda Warren Projects. Nadi Design is one of the six finalists in ArtHouse's public art commissions. This team will submit a proposal for the ArtHouse commission Illumination. The artists selected for ArtHouse's public art commissions will be announced in late May 2016. At Nadi Design we are committed to creating memorable destinations, places and spaces in the public realm that make a difference in the lives of the people they serve— whether the space just brightens their day or has an impact on how they see the world around them. In reading about the Bloomberg Philanthropies Public Art Challenge at ArtHouse, we felt the competition spoke to our firm’s philosophy. We were instantly on board. 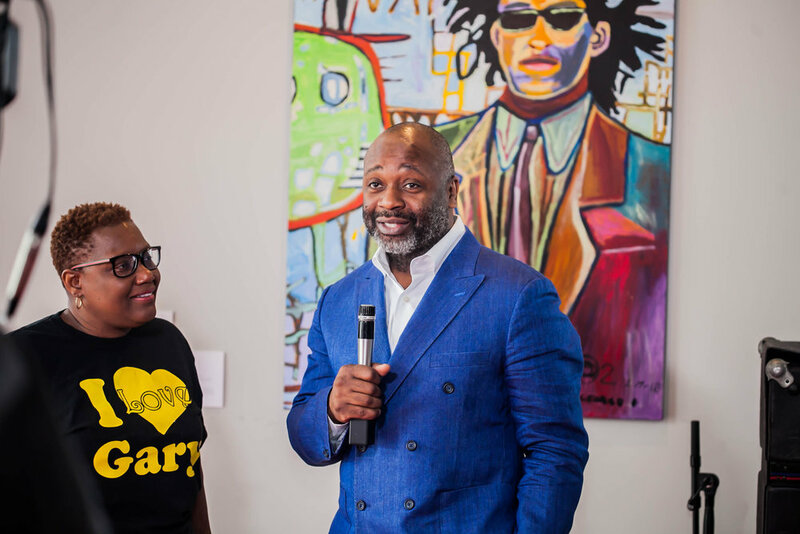 Gary’s rising community energy, represented in part by individuals such as the unbelievably spirited and enthusiastic Mayor Karen Freeman-Wilson, and Theaster Gates, Jr., who is directly involved in ArtHouse itself, became another motivation for applying for the Art Challenge. As far as a connection to Gary, Indiana, we have an office located in Chicago, Illinois so our connection to Gary is being neighbors to the community. Andrea Polli’s Particle Falls, is a temporary, traveling, public art piece that communicates with the public about the air quality in their community. The piece is an animated light projection of blue falling lines representing clean air and yellow lights representing particles. The piece changes with the atmosphere around it. The surrounding air is continuously analyzed and the imagery projected alters with the findings of the analysis. The piece reflects the amount of air pollution in the community and in a beautiful way it raises awareness of the concerns regarding air pollution close to home. Our approach to designing for a public commission does not differ from how we design for other clients. In every instance we aim to produce work that connects with the genius loci of a place. There is always the need to learn and understand the context. Our design approach and methods work with a thorough, collaborative understanding of the aims and needs of our client, regardless of if that client is an individual, a corporation, or a community. Water feature in Water Bend Park, Manitoba. Designed by Nadi Design. We feel public art is important to communities because art is essential in creating communities. Public art activates dialogue within the community; it gives character to the spaces inhabited by the community and form landmarks/destinations in the fabric of a community. Public art aids in making places and spaces for communities to identify with, question and build memories around. We envision generations of Gary’s citizens being involved in the process of bringing the design vision to reality. We would engage the youth of Gary for their input and thoughts on the conceptual design. We would also inspire the youth to be the “on the ground” promoters of the project. We hope the youth will spearhead the social media campaign publicizing the concept of the installation and their home, Gary, Indiana. With the energy of the youth behind the social media campaign we see the larger community being inspired and joining in. Local manufactures would also be approached to participate in the fabrication of the components of the installation. We hope to enable opportunities to have youth alongside the skilled trades of Gary learning and helping out in the fabrication of the installation as is appropriate. With the installation and the process leading up to the installation we are aiming to convey to the community and surrounding areas that Gary, Indiana is not a vacant, declining community but a community of opportunity, full of potential and strong spirit. We hope to convey that Gary, Indiana is a community poised for growth and showcase ArtHouse as being a catalyst for this growth. The team here at Nadi Design is abuzz about the competition, we all thrive on design and delight in opportunities involving community based design. We are honored and excited about being short-listed for the ArtHouse: Illumination competition and are looking forward to meeting the ArtHouse Team and jury members on Monday. We also hope to stop in at Mama Pearl’s for a bite to eat. At Nadi Design we have made it part of our studio culture to enjoy food together, every two weeks we have afternoon appetizers and drinks together and every Monday morning we meet over a homemade breakfast provided by a different co-worker each week. We like to think of ourselves as not only design connoisseurs but also amateur food connoisseurs or you could say we just enjoy our food. Nadi Design is a boutique design practice providing meaningful service to its clients, environments, and communities. With a desire to leave a positive, sustainable, and memorable legacy in every environment it touches, Nadi Design strives to build a practice based on integrity, collaboration and trust, and believes that people and their daily interactions form the core of great public spaces. Specializing in interior design, urban design, planning, landscape architecture, and land art, Nadi Design seeks to enrich communities through innovative, thoughtful designs that generate civic pride. Learn more about Nadi Design. Felix "Flex" Maldonado Jr. is one of six finalists chosen to make a full proposal for ArtHouse's public art commissions. Maldonado will propose a work for the commission Surface. The artists selected for ArtHouse's public art commissions will be announced in late May 2016. What motivated me to apply was the fact that I wanted to take on the challenge of such a great project. I have direct connections to Gary in the sense that I grew up working with my dad at U.S. Steel, and having family and friends from there, I felt it was my duty to represent the region. The Chicago Picasso, an untitled monumental sculpture by Pablo Picasso sited at Daley Plaza in Chicago, Illinois. Photo by J. Crocker. Although I feel any successful public work should portray some sense of inspiration, I first felt the impact of such success when I first started art school and saw Picasso’s Chicago sculpture at the Daley Plaza. My approach to any public commission does not really differ too much from my clients or private work because I take every project, commission or body of work with the same quality, pride and work ethic— anything less is unacceptable. Having done numerous public art projects, I find it a very important vitality to any community. Aside from the visual inspiration (or just seeing something more beautiful than what was previously there) It creates a platform for dialog within the community. Portrait by Flex Maldonado. Image courtesy of the artist. If my proposal is chosen, God willing, I plan to incorporate the community into the mural; literally. I would like to keep my vision as genuine as possible by holding a “call-for-models” photoshoot and invite the people of Gary to model for the subjects that I have lain out in the mural. I want to convey the fact that Gary has not been forgotten but is rather very alive and actually progressing. I believe in the people of this region, they are very resilient by nature and have no plans on giving up. but I also want to convey that change is good and that it starts with one’s self. I just want to thank everyone at ArtHouse for the tremendous opportunity to represent my region and if chosen I promise to not let the people of Gary down. Felix “Flex” Maldonado Jr. is a native of East Chicago, IN, Maldonado is a self-taught artist with more than twenty-five years of experience in painting, drawing, and graffiti art. He received his BFA in Advertising with a minor in Graphic Design from the American Academy of Art in Chicago. He has worked with several ad agencies in Chicago, and has directed and produced commercials for companies like Culligan Water, Peoples Energy, Roto-Rooter, Head Tennis and ATA Airlines. In 2003, Felix helped form CISA Studio, LLC., a creative services company producing local and national work in various disciplines, including murals, custom paint and airbrushing, advertising, design, and multimedia. Maldonado’s history of solo and group art exhibitions include exhibitions at the South Shore Arts Center (Munster), CISA Gallery (Hammond), The Mexican Fine Arts Museum (Chicago), Art Expo (Chicago), Swope Museum (Terre Haute), SOMArts Museum (San Francisco), Armory's Fountain Art Fair (New York City), and the “Paint, Paste, Sticker”/ Street Art show at the Chicago Cultural Center.